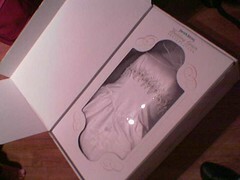 Amy’s wedding dress, stored away in its preservation and display box. Awwwwww! I’m so happy for you two! I’m not sure how large the box is, maybe two feet by three feet? In any case it will be staying in my parents’ house, at least while we are living in our current apartment.